Whether you are completely replacing your pontoon decking or just re-carpeting your existing pontoon deck it would be a good idea to check your current deck bolts while everything is tore apart. The main purpose of replacing your pontoon boat decking or carpet is to protect your investment and make sure your craft not only looks great season after season but is safe as well. Our marine hardware is the same stuff used by major boat manufactures. So, replacing old hardware with our hardware is easy. To install these pontoon bolts through new decking pre-drill 1/4" holes through both the pontoon deck and the aluminum cross channels. Space these holes approx. 12" - 16" apart. 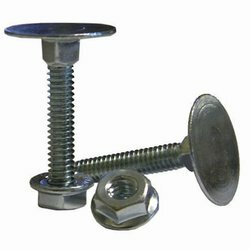 Place your new deck bolts through the newly drilled holes and proceed to the underside of the boat to secure the bolts with the new included Flange Nut. This pontoon hardware is in stock and will ship within 24hrs of placing your order.